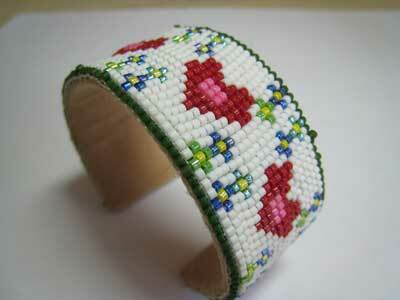 If you're looking for beaded bracelets that are unique, take a look at this lovely "My Heart is Home" beaded cuff. Made on a loom with hand-selected Delica beads (the most expensive seed beads), this piece of jewelry is sure to get you lots of compliments. This particular bracelet makes the perfect gift for Valentine's Day and since it is one-of-a-kind, you'll never find another exactly like it. Buy it now and tell your sweetheart that in your relationship, it feels as though your heart has finally found its home. Bracelet measures 1 inch tall by 6 3/4 wide. Since it is made from a light and flexible cuff, it can easily be shaped to fit your wrist exactly. Beaded bracelets ship via Priority Mail.